Facial asymmetry and typing of Brigs-Majers. 6. 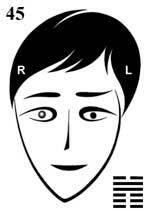 ( L ) the left eyebrow - active ethical function. 5. ( R ) the right eyebrow - passive logic function. 2. ( L ) the left corner of a mouth - obvious sensory function. 1. ( R ) the right corner of a mouth - not obvious intuitive function. Eyebrows - accent perception of figurative energy and generalized matter, and not accent perception of sign energy and detailed matter. Mouth - combined perception of valid and potential time, and also concrete and abstract space. Attributes of choleric temperament as ethical function is active.